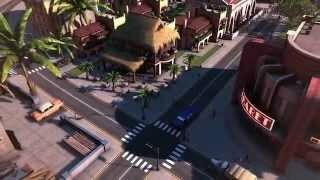 The Tropico franchise is perhaps not as widely known as Sim City, but over the last decade it has established its own unique brand of city building simulation. Since landing in the hands of Haemimont Games and being rebooted with the third entry, we’ve already seen a fourth game, and now the fifth stands awkwardly at our door. It’s wearing all the same clothes, seemingly unaware of the passage of time since the last game, and looking to impress strategy fans once more with its whacky presentation and solid sim foundations. Sadly, despite a few additions and changes to the gameplay, Tropico 5 is beginning to make the franchise feel like it’s stuck on repeat. As has been tradition, players assume the role of “El Presidente,” a leader of a small island in the Caribbean. You oversee your piece of paradise by creating a functioning town, controlling everything from housing to tourism, resource mining, military, farming, and so forth. You place buildings down, and watch as your workers from the local shop drive or walk over and construct it. The buildings automatically fill their job vacancies, providing employment to your people. When you’re not fast forwarding time, waiting for the buildings to finish, players can dive into their island’s political intrigue. You can bribe officials, sabotage elections, enact edicts and laws to your liking, or even unleash the military on any rebels or problematic individuals. These social management options remain unique to the franchise, though there’s hardly anything new here. Conceptually, the moment to moment gameplay is vastly the same as Tropico 4. But let’s dig into the new additions. The overall progress of your reign on the island is now broken up into eras. While previous games focused on the Cold War era, there are now four time periods to deal with. Starting from the Colonial era, you must actually first break away from the crown and establish your independence, before carrying on to the more familiar World War, Cold War, and Modern eras. The passage of time serves as a limit to heed player progress when it comes to building up their island nation, and as a way to provide different personalities and objectives. Unlike before, the buildings available to the player are not simply locked away behind a price tag – you must now wait until the appropriate era in order to build specific structures. It takes away some of the initial anxiety players may have had when faced with endless construction possibilities, funneling you down a specific build order. Building docks is more crucial than before, as you’re now able to manually send your ships on trade missions of export or import. Although it works as a design concept, the build order ends up being largely the same anyway due to cost and research, and it may be annoying for experienced players to wait multiple eras before getting their tourism industry started, for example. Speaking of research, that’s another new addition that aims to guide players through the years. Certain buildings only become available after they are researched, which amounts to little more than clicking on an item and waiting for it to be done. There’s also a certain order to research, and you can queue up to 3 items. This system adds another layer of micromanagement, but it does nothing to improve the overall experience. The different eras can also produce odd building and unit combinations, such as the ones you’d see between two nations far apart in research progress in a game of Civilization. You can also assign managers to buildings, and also purchase upgrades to improve their effectiveness. The manager of a building can be El Presidente himself, or one of the seemingly random talented folks on the island. Managers provide small, specific boosts. This amounts to mo micromanagement for tiny gains. Between eras, players can draft a constitution with three different passive effects, to skew their leadership over the people in whatever direction they desire. The results are similar to issuing edicts, so it’s the same thing with a different look. That goes for most of the game’s interface as well, which has been redesigned simply for the sake of being different. With construction underway, you’ll have to deal with the various demands from your people as well as external influences. From homelessness to poor job quality, civil unrest and a demand for better health care and education services, there will always be ways to improve the happiness of the populace. Unfortunately, hard as you might try, the AI remains unconvincing. It can be frustrating when a tiny fraction of your people drag down your island’s ratings because they are unhappy with their job. You can throw every type of building on the land, but some groups will seemingly never be happy. The royalists and revolutionaries of the colonial era are followed by the communists and capitalists, and then environmentalists and industrialists, but everyone complains and demands in equal measure about similar things. They can be dealt with via “special” methods of a dictator, but surely there must be ways to win the popular vote without resorting to exceedingly dirty tactics. While these dynamics have always existed as a core gameplay mechanic in the Tropico franchise, never have they been as annoying as they are in this entry. But unlike in the past, you no longer have to face the scrutiny of the people alone. Tropico 5 allows the creation of a Dynasty – a family that shall forever rule the land. Instead of creating El Presidente with many traits, players create a family with up to 7 members, each with a single trait. Each member can be used as a manager for a building or take on missions, such as becoming a student abroad. The idea of a dynasty is again an acceptable one, but it doesn’t pay off. The main player character no longer feels distinctive or important, and gone are the quirky personality customizations that made El Presidente feel unique to the player. The dynasty members can no longer be controlled directly and simply feel like lifeless avatars providing passive benefits to the island, making them more impersonal than ever. The overall structure of the game is split into three areas – sandbox, campaign, and multiplayer. In sandbox mode, you can play in any way you wish, with no pressure to complete missions or take on objectives to please external forces even as they keep popping up. Single player campaign is structured a bit differently than usual – there are two islands to choose from, each with its own narrative thread. You’ll progress through the game by playing story missions across these two islands, with your progress carrying over all the way to the end of the 15 or so mission campaign. It’s an odd design, given that you arrange the island to focus on the goal (i.e. natural resources), but the next campaign mission could present a different task entirely (i.e. military). So now you’re stuck trying to rearrange your whole economy balance, and hopefully you’ve got a gamesave – because with no mission select option, you’re going to have to restart the whole campaign if something goes wrong. A brand new addition to the franchise is the inclusion of multiplayer. When online, the time is always moving in fast forward, so players will need to make decisions with relative haste. Playing cooperatively, you share an island with up to three other players and with a game-enforced no combat rule, each building their own slice of paradise. A multiplayer diplomacy interface doesn’t exactly offer a wealth of options that affects the game in any significant way. Fog of war (that pointlessly exists in single player) ensures that you’re not able to see everything that the opponent is doing. This comes in handy more for the competitive modes. As you battle for control of the island against other players, victory is determined by winning challenges, such as exporting certain goods or building certain structures. Alternatively, your military might be the winning ticket. Multiplayer is functional, but has numerous shortcomings such as limited chat filter functionality, connection instability, and bugs. Like the rest of the game, Tropico 5’s visuals strike a very familiar chord. Aside from the changed user interface, putting a screenshot next to one from Tropico 4 would be hard to distinguish. The game is still decently well animated and its bright visuals feel warm and inviting, but zoom in close and many rough areas begin to appear. Most of the buildings look very boring architecturally, and closely resemble the previous game’s models, rough edges included. The signature Latin music is still very upbeat and catchy, but sounds so eerily familiar that one has to wonder if tracks were simply imported from past games. This presentation style has always been a crucial factor for the franchise, but at this point, fans may find it repetitive. It’s difficult to come up with sequels for a strategy game franchise; you must perform a delicate balancing act between keeping the mechanics familiar yet also innovating in meaningful ways. 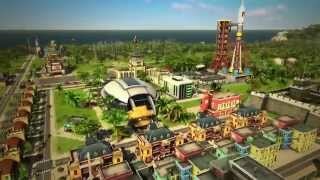 In that regard, Tropico 5 does its best to shuffle ideas around and give players a new reason to return to this ocean paradise. Sadly, most of the ideas fall short and don’t feel meaningful in the grand scheme of things. It’s still not as deep as Sim City in the late game, or as engaging as Banished in the early days. The largely unchanged presentation is starting to seriously lose its charm, and various small gameplay issues compound the feelings of annoyance. There’s still a very competent city building experience to be found here, but longtime fans may want to start worrying about the future of El Presidente. The music and personalities are still charming, but are starting to wear thin. Graphically very similar to the previous game. Although there is a wealth of new features, most feel like needless changes and tweaks that don't really affect the overall experience. An average length campaign, but one that is continuous and thus requires manual saving, or you risk needing to restart the whole thing. Both competitive and cooperative modes work, and can be fun if you can avoid the bugs and have friends that will stick around. Doesn't take advantage of multiple players on the same island with any new mechanics. No major issues to report. Some connectivity problems for multiplayer.